Talking of comfort food….how do I describe a bowl of fragrant Basmati rice with warm and inviting Tadka Dal and the Crunchy Apple Pickle, …….especially after coming home, wet, damp and cold ? As an added bonus, this recipe is with the quick cooking masoor dal/ red lentils…so read on! It is pouring here today, which made me think of Tadka dal. This is a recipe for the most accommodating dal that I make. I use masoor dal as it cooks super-fast on the stove top. 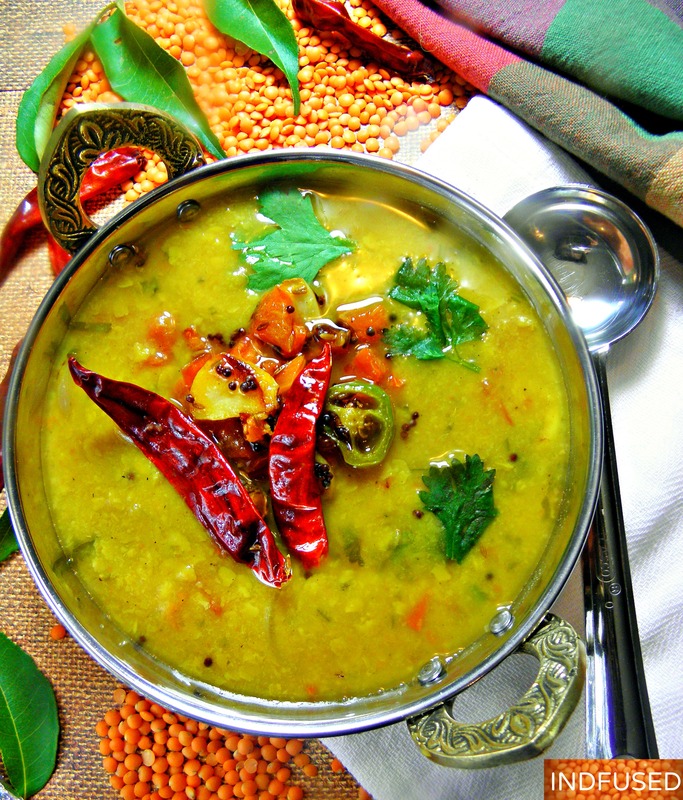 But you may use toor dal or mung dal for this recipe too. This dal recipe is also very adaptable. I can cook 2 cups of the dal at a time and refrigerate or freeze half for use later in the week. I change the tadka, which means the tempering oil and spices and/or add spinach or methi leaves to the other half and in a few short minutes I have a new dal! You know that I strive to make my recipes healthier without sacrificing the taste. For recipes such as these, more oil and or/ghee is used to caramelize the onions and fry the tomato. Instead I stir fry the onions until caramelized and add ¼ cup water to soften the tomato after stir frying it . Honestly, I could do without the additional fat these days. Heat the dal, water, turmeric and sea salt in a saucepan, over medium heat. When it comes to a boil, lower the heat and let the dal cook for about 18 to 20 minutes or until completely cooked. The dal turns yellow and the individual split lentil can be easily mashed between your finger tips or between a plate and a spoon. Set aside. If you like a smooth textured dal, use a wire whisk to lightly whip it. In a separate pan, heat the oil and ghee (or coconut oil) over medium heat. Add the mustard seeds and cumin seeds and as they start to sizzle and sputter, add the chili peppers, garlic and onion. When they start to caramelize, add the tomato. Stir fry it and add the 1/4 cup water and let the tomato cook. Add the cooked dal, brown sugar and lime juice. Stir and add water, according to your desired dal consistency. Add salt, if needed and let the dal simmer for a few minutes. Top with the chopped cilantro/coriander leaves and serve with cooked Basmati rice and the Crunchy Apple Pickle. superb picture! absolute comfort food! Your Tadka Dal with water, tumeric and softening reminds me of how I use chick peas to make a paste or dip. Lentils are delicious in soup so I need to try them in this dish. Lastly, I dearly love how you use ingredients to caramelize in a pan to make a delicious sauce with tomatoes and spices. Onions, cumin, chili peppers, mustard seeds and garlic make it sound savory. I bet the house smells mouth-wateringly good! Thank you so much Robin for your sweet words. You are so kind! Oh wow, thats just beautiful, perfect comforting soup for the cooler weather. Suzanne , yes we had torrential rain in the Boston area and the tadka dal seemed perfect for the weather. Very different recipe from what I use. Have never used sugar in my dal unless I make gujrati dal.. Wow…your tempering sounds heavenly. Comfort food at its best Sandhya. Love the colors in that dahl and the picture and styling came out just superb! Additional lighting? Whatever you’re doing, keep it up because it is gorgeous! Looked for your post on reader yesterday and did not find it. I was about to go on your site now! It looks doable and great for cool weather. I will try this. so good to know I can freeze dal. Thank you so much! Do let me know how you like it. Thank you so much! I like trying different versions of the tadka dal too.